Just a week before Christmas, the album that caused Brian Eno to call its makers “the most important band in the world” was reissued on CD by Grönland Records. Sadly, that album didn’t go on to sell millions of copies. Far from it. Musik Von Harmonia, the debut album from German supergroup Harmonia, failed commercially. Its release almost passed unnoticed in 1973. So did the followup Deluxe in 1975, which has also been reissued by Grönland Records. Harmonia cofounder Michael Rother remembered this period, when I interviewed him in late 2015. “The seventies weren’t a good time for Harmonia. Our music was ignored, it was tough to survive during this period.” Harmonia weren’t alone. Other Kominische bands were releasing albums that passed almost unnoticed. Can and Amon Düül II were in a similar boat. Even Kraftwerk’s first three albums weren’t a commercial success. It was a similar story for Neu! back in 1973. Back in 1973, Neu! had just released their sophomore album Neu! 2. It failed to match commercial success and critical acclaim of their eponymous debut album. Neu! had sold 30,000 copies in Germany alone. This was good for an underground album. However, Neu! 2 was a different matter. The problems started when Neu! went into the studio to record Neu! 2. They had booked ten days to record their second album. This should’ve been plenty of time. Neu! had recorded their debut album in four days. However, Micahel and Klaus spent too long recording side one of the album. With only three days left, the pair panicked. Desperation set in. Then they remembered a single Neu! had released, Neuschnee which featured Super on the flip-side. This was the solution to their problems. With Neu! 2 complete, it was scheduled for release later in 1973. When the album was released, critics were won over by side one. Neu! were refining the sound of their debut album. Für immer was Neu! 2’s masterpiece. However, critics weren’t impressed by side two. Many critics saw the music as gimmicky, and accused Neu! trying to fool and rip off record buyers. Indignant critics took the moral high-ground. Some record buyers agreed. “They felt that we were trying to rip them off. That was not the case.” Side two was Neu! at their most experimental, deconstructing ready made music only to reconstruct or manipulate it. However, neither critics nor record buyers realised this, and Neu! 2 failed commercially. This left Michael Rother and Klause Dinger with a problem. Both men decided to look for a solution to the problem. Klaus headed to London, where he tried to drum up interest in Neu! Meanwhile, Michael found the solution to his problem in a song. After hearing “Im Süden, a track from Cluster’s sophomore album Cluster II,” Micahel Rother decided to turn Neu! into the first German supergroup. So Michael embarked upon a journey to the Forst Commune, where his he had a proposal for two of his friends, Dieter Moebius and Hans-Joachim Roedelius of Cluster. As Michael made his way to the Forst Commune, he wondered if Dieter Moebius and Hans-Joachim Roedelius would be interested in joining an extended lineup of Neu!? Then Michael began to consider another possibility, a German supergroup consisting of Neu! and Cluster? This would be a first. Nobody had ever tried this before. It was the opportunity of a lifetime. Soon, it became apparent that Michael’s idea of a supergroup was about to take shape, just not in the way Michael had originally envisaged. That initial jam later became Ohrwurm, a track from Harmonia’s 1974 debut album Musik Von Harmonia. Following their initial jam session, Michael stayed at the Forst Commune to prepare for the recording of Harmonia’s debut album. Germany’s first supergroup had just been born. It wasn’t an extended version of Neu! Instead, it was a new band Harmonia. Opening Musik Von Harmonia is Watussi. Rhythmic and hypnotic describes this track. Drumbeats courtesy of a drum machine crack, joining banks of synths. Constant panning is used, so the sound assails and surrounds the listener. Hypnotic but joyous, this is classic Kominische, albeit with a twist. The twist is the ambient influence. In the background, ambient and experimental music are fused. Washes of synths, percussion and searing, blistering guitar combine with effects. This results in a mesmeric and innovative fusion of classic Kominische with elements of ambient, avant-garde and experimental music. Sehr Kosmisch has a much more understated, subtle sound. It’s best described as an ambient soundscape. The music unfolds in waves, growing ever closes. The drama grows, as drums steadily pulsate. There’s a cinematic quality, as purposely, Harmonia march to the beat of the drum. Meanwhile, washes of synths are variously ethereal and jagged, meandering as their eerie, broody sound grows. As the arrangement progresses, the drama builds. Gone is the understated sound. There’s a still a hypnotic, pulsating sound to the dramatic arrangement. It still unfolds in waves as it builds to its crescendo, as Harmonia reinvent Kominische muzik with a groundbreaking, moody, cinematic Magnus Opus. Sonnenschein bursts into life, the arrangement panning from right to left. Guitars reverberate and are joined by synths, drums and futuristic, otherworldly sound effects. Together, they create a bold, dramatic and almost grandiose arrangement. Soon, it’s as if Harmonia are taking the listener on a journey. Harmonia become a benevolent, modern day Pied Piper, and the listener marches along as if en route to some idyllic, rural Kominische utopia, where carefree communal living offers an alternative to the drudgery of 9 to 5 and der mann. As they march along, Harmonia continue to rewrite Kominische music’s rulebook. To do this, they fuse ambient, avant-garde, classical, experimental, rock and world music. This results in music that’s hypnotic, grandiose, dramatic, futuristic and impressive, as musical visionaries Harmonia, continue their pioneering musical journey. Dino is driven along by the drums, while guitars wah-wah and synths buzz and beep. Straight away, there’s a similarity to Neu!’s first two albums. That’s thanks to the hypnotic Apache beat. It’s present despite only one half of Neu! playing on Musik Von Harmonia. However, Klaus Dinger’s influence can be heard by proxy. The Apache beat is replicated by a drum machine. Soon, elements of Neu!, Cluster and Krafterk shine through. The mesmeric Apache beat, and Michael’s shimmering, sometimes choppy guitar play leading roles. By then, Harmonia are in top gear. Aided and abetted by Dieter and Hans-Joachim, they create what’s the perfect soundtrack to any journey down the Autobahn. Swathes of eerie, haunting synths open Ohrwurm. Add to this pizzicato strings and experimental guitar. Feedback hangs in the air, as the track takes on an avant-garde sound. It’s as if Harmonia are just jamming, seeing where this leads. This was what Can did, and called spontaneous composition. By now, fuzzy guitars are sprayed across the arrangement. Menacingly, they hang in the air. So do the the jagged synths. It all becomes very avant-garde and experimental, but strangely melodic and compelling. Harmonia it seems, are determined to constantly reinvent their music, and do so, almost seamlessly. Ahoi has an spacious, ambient sound. Just a melancholy keyboard and chiming guitar combine. They meander along, seemingly in no hurry. Space is left, as the keyboards and guitar keep each other company. The guitar reverberates into the distance, while a wistful piano poses questions that are never answered. Later, it’s all change. Waves of dramatic music threaten to assail you. Urgent strings, hypnotic keyboards and a myriad of percussion swagger along. By then, the arrangement veers towards discordant and disturbing, but remains the rights side of dramatic. A song of two parts, it shows two equally enthralling sides to Harmonia’s music. Veterano is a dramatic, driving fusion of Kominische, psychedelia and rock. Synths, crunchy, punchy drums and mesmeric keyboards unite. They drive the arrangement along. Meanwhile guitars drift in and out. They’re panned hard right, and sometimes, sound hesitant. Other times they’re responsible for some peerless solos. A myriad of percussion adds to the hypnotic nature of this driving, urgent arrangement that forty years later, is truly timeless. Hausmusik closes Musik Von Harmonia. A vintage sounding keyboard plays in the distant. It sounds like a reminder of another age. Gradually, it draws closer. Washes of synths, percussion and wailing guitars are panned right to left assailing and surrounding you. It’s as if Harmonia are determined to close their debut album on a high. This they do, mixing vintage and space-age sounds to create a soundscape that’s innovative, ethereal, multilayered and full of nuances and subtleties. Forty-two years after the release of Musik Von Harmonia, Harmonia are somewhat belatedly getting, the recognition their music so richly deserve. Harmonia are now regarded as one of the finest purveyors of Kosmische musik. Each and every one of these groups were innovators, whose music was way ahead of its time. The musicians in these groups, including Harmonia were visionaries, who were determined to make a new type of music. This music was neither going to be influenced by American nor British music. Instead, Kosmische musik’s roots can be traced to the late-sixties, and in a way, were a reaction against the rigidity and rules of traditional music. No longer were musicians willing to be constrained by the rules of modern music. They wanted to free themselves from the shackles of rules and rigidity, and in the process, create new and groundbreaking music. To do this, they fused a disparate and eclectic selection of musical genres. Everything from avant-garde, electronica, experimental rock, free jazz and progressive rock influenced and inspired Kosmische musik. Michael Rother explained: “we weren’t influenced by the blues music that had influenced other musicians. That wasn’t our music. Nor was the Schlager music which our parents listened to. We were looking for something new. Musically this was our year zero.” So in the late-sixties, this new breed of you German musicians embarked upon a musical revolution. By 1974, when Harmonia released their debut album Musik Von Harmonia, Germany was in the midst of a musical revolution. At the forefront of this vanguard for change, were Can, Kraftwerk, Amon Düül II, Neu! and Popol Vuh. Only Kraftwerk had made a breakthrough. Even then, that came when Kraftwerk changed direction musically upon the release of Autobahn in 1974. They were like a new band, almost unrecognisable from their first three albums. Like the starving artist, other Kosmische bands, stayed true to their principles. Others gave up altogether, and it’s only fairly recently, that they’ve started to receive the plaudits they so richly deserve. That’s the case with Harmonia. It’s a far cry from the seventies, which an almost rueful Michael Rother remembers; “wasn’t a good time for Harmonia. Our music was ignored, it was tough to survive during this period.” Survive they did. Not only did Harmonia survive, but recently, they’ve thrived. Harmonia’s music has been rediscovered by a new generation of music lovers. This has lead to Harmonia’s music being reappraised by music critics and cultural commentators. Somewhat belatedly, they’ve realised that Harmonia were musical pioneers, whose music was groundbreaking, innovative and way ahead of its time. This has lead to Harmonia’s back-catalogue being remastered and reissued. The first part of this reissue program, was the release of The Complete Works box set in October 2015. Michael Rother oversaw the reissue of the five album box set by Grönland Records. So it’s no surprise that The Complete Works is a lovingly compiled and curated, luxurious box set. It’s a fitting way to celebrate, and document the career of one of the greatest bands in the history of Kosmische musik. For fans of Harmonia, Santa Claus had come early. He came bearing gifts a week before Christmas. This was the remastered reissue of Harmonia’s debut album Musik Von Harmonia, and the followup Deluxe. They’ve been reissued on CD by Grönland Records. The sound quality is absolutely stunning, and sets the bar for all other reissues. All of Musik Von Harmonia subtleties and nuances shine through. It has a far superior sound quality to the other CD version of Musik Von Harmonia that I have. When I compare them side-by-side, not only is the sound quality is far superior, but the Grönland Records’ reissue has a much wider dynamic range. So much so, it’s like listening to a new album. Just like The Complete Works’ box set, it’s a fitting homage to one of the most innovative bands of the seventies. Brian Eno went much further. On hearing Musik Von Harmonia, Brian Eno called Harmonia: “the most important band in the world.” Harmonia went on to inspire and influence several generations of musicians during the seventies, including David Bowie, Brian Eno and Iggy Pop. Since then, several generations of musicians have been inspired by Harmonia, and their critically acclaimed debut album Musik Von Harmonia. Innovative and timeless, Musik Von Harmonia is not just a Koninische classic, but a classic album, and one that deserves to find its way into every record collection. 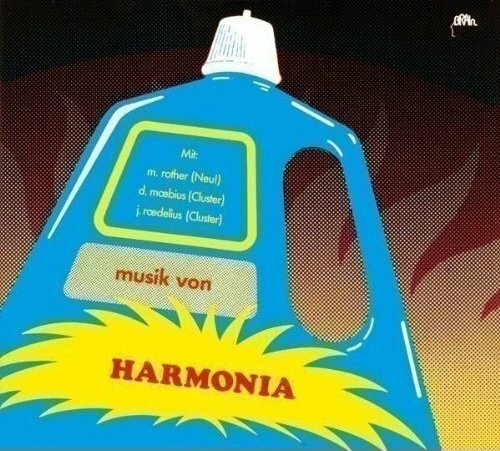 Musik Von Harmonia is a reminder of one of the most important, influential and innovative bands in Kominische muzik history, Harmonia, who deserve to sit at its top table alongside Can, Kraftwerk and Neu! ← SENEGAL 70-SONIC GEMS AND PREVIOUSLY UNRELEASED GEMS FROM THE 70S.